Mt. Saint Helen's, is a national monument and active volcano. She is one of 5 Washington State volcanoes and it was May 18, 1980, when the eruption brought this quiet mountain to the world's attention. On your tour, you'll see the devastation caused by the 1980 eruption and the slow return of nature’s flora. A full day of adventure, you'll visit: Mt. St. Helen's Silver Lake Visitor Center, grab lunch at a local restaurant, and visit Johnston Ridge Visitor Center. This might be a private tour, or you may go with another couple. Five people maximum allowed in our comfortable SUV. Departing Seattle from your hotel, B&B, airport or pier, you'll travel South to Castle Rock, then to the first stop, the Interpretive Center. Here you see the mountain in the distance and inside the interpretive center, get a good visual of the before and after May 18, 1980 blast. Then on to eat lunch as you continue up Spirit Highway to Johnston Ridge. 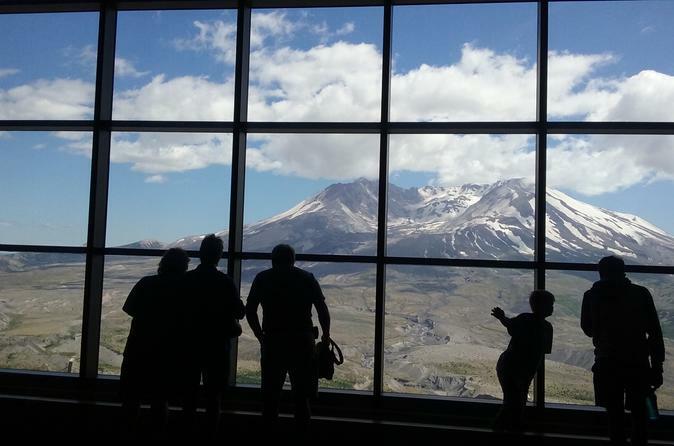 The visitors center here is perfectly situated on the slide-side of Mount Saint Helen's with an incredible view of the devastation from the blast and slide. You'll stop a few times for photo shoots, of course! You'll see a short movie at Johnston Ridge and get a feel for what it was like, then you'll make your way back, past the downed trees and new forest, only 35 years old. If the weather decides not to cooperate, we will gladly switch the tour to visit the Mt. Saint Helen's Lava Tube, a cave created by hot gasses from an explosion 2 thousand years ago. Same price, and though very different tours, still with the same theme!